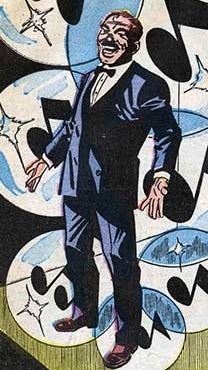 Powers/Abilities: A normal human, Joe Martel had no paranormal abilities. Originally in his home-country, Martel liked to sing opera--he had a powerful voice, but he apparently sang off-key and was ordered to stop. 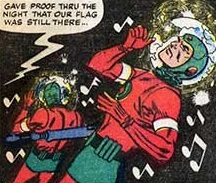 A recent immigrant to the United States, Martel became a loyal and patriotic citizen of his new homeland, and he was able to foil an alien invasion with his shrill rendition of The Star-Spangled Banner. (World of Suspense#5/4 (fb) - BTS) - The past of Joe Martel is largely unrevealed, but he originally lived in the "old country" (see comments), where he used to sing opera--he wasn't very good, and "they" made him stop. Three months prior to the following events, Martel emigrated to America and eventually obtained employment as a waiter at a banquet hall. 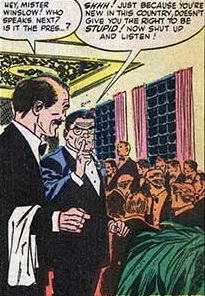 (World of Suspense#5/4) - One night, Martel was working at a very special political dinner where the guest of honor would be the President; Martel was quite excited, and he asked Mr. Winslow when the President was scheduled to appear, but his boss rudely told him to be quiet. As the banquet's master of ceremonies announced the President's arrival, the lights suddenly went out. In the darkness, a deep booming voice ordered everyone not to move and informed them that they were all prisoners. The lights came back on, and a group of armed and oddly garbed men from another world stood guard at every door; the leader of the group introduced himself as Zarki, and he informed everyone that resistance was futile--Martel asked Winslow if it was all a joke, but Winslow sternly told him that it was deadly serious. The guards sworn to protect those in high political office leaped into action, but Zarki and his men fired warning shots at them with their ray-weapons. Martel was aghast, for he couldn't believe such an event was actually happening in America, and Mr. Winslow ordered Martel to shut up and do what the aliens ordered, for they couldn't fight the superior forces. 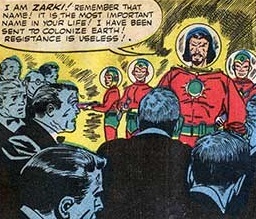 Zarki told everyone that they would be questioned, for although he and his men knew much about Earth, they wanted certain information from the world's leaders. Zarki threatened his prisoners with death if they didn't talk, but when he began his interrogation, each man in attendance refused to cooperate, so Zarki told them that they would all die. But Martel was secretly formulating a plan to stop the invaders; he spoke up and told Zarki that he would tell him all that he knew, for he had only been in the country for three months and he didn't want to die. 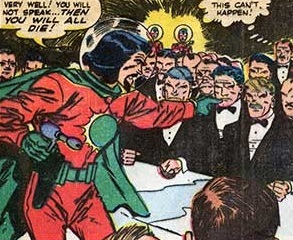 As he walked over to Zarki's side to join him, one of Joe's fellow waiters rushed forward to physically attack him for his perceived treachery, but Zarki fired his ray-gun to stun the man. Zarki complimented Martel for making a wise choice in siding with him, and he told Joe that he would be rewarded for his cooperation--the other men in the banquet hall could only condemn Martel as a traitor. Then Martel began his plan--he asked Zarki if he could sing, and Zarki rewarded Martel by granting his request. 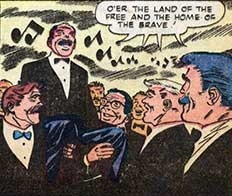 When the little immigrant waiter began to sing, every man in the banquet hall was stunned by his choice of song--the American National Anthem! Joe Martel continued with his singing, and his voice grew louder and shriller as it echoed and vibrated throughout the room. As the veins in Joe's neck bulged and the blood pounded in his brain, he sang louder and louder until his booming voice shattered the bubble-helmets of the alien invaders--exposed to Earth's atmosphere, Zarki and his men collapsed to the floor. With the alien invaders defeated, the grateful banquet attendees rushed forward and lifted Martel upon their shoulders; they all joined in with Joe's singing of the National Anthem, and there wasn't a dry eye among those present as they payed homage to Joe Martel, waiter...American! 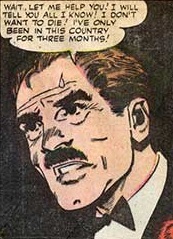 Comments: Created by an unidentified writer and Don Heck (artist). Joe Martel's home-country was never mentioned, but the surname "Martel" has its origins in the southwest area of France bordering Spain. The race of the alien invaders was never mentioned (The title of this 4-page story only referred to them as "The Men in Glass! 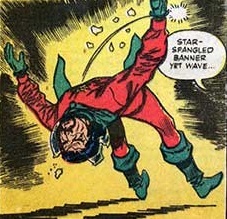 "), but my guess is that Zarki and his men were pink-skinned Kree--the Kree's native environment has a higher nitrogen-to-oxygen air content as compared to Earth's atmosphere, and the Kree originally could not survive in high-oxygen environments without special breathing devices and potions (which would account for the bubble-helmets Zarki and his men wore); additionally, that emblem on Zarki's chest is similar to the symbol used to denote the rank of a major on the Kree militia uniform. 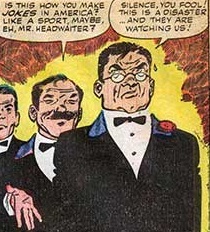 The head-waiter of a banquet hall, he was Joe Martel's immediate superior. 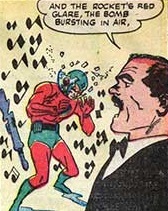 He seemed to hold Martel in low regard, but his opinion probably changed after the immigrant foiled an alien invasion. Warriors of an unidentified alien race, they were apparently unable to breathe in Earth's atmosphere, so they wore transparent bubble-helmets (see comments). They were armed with ray-weapons--Zarki with a handgun, his soldiers with rifles--that fired green energy beams which could stun--presumably, their weapons could also be set to kill. According to Zarki, they were sent to colonize Earth. They suddenly appeared in a banquet hall (possibly via teleportation?) where several political figures were having a dinner in honor of the President (According to Zarki, they needed certain information from the world's leaders). They were all defeated by Joe Martel's shrill rendition of the United States' National Anthem, which shattered their bubble-helmets and exposed them to Earth's atmosphere.